Any good garden soil with average or better drainage. Full sun to partial shade in warm climates. Good. Young plants set out in fall survive winter cold in many climates. Encourage fast growth by mixing a balanced organic fertilizer into the soil before planting. Drench plants with a liquid fertilizer every three weeks to support prolonged blooming. Tatsoi and Mizuna. Combine petite johnny jump-ups with other hardy annuals such as dusty miller or dianthus. Johnny jump-ups also combine well with chrysanthemums, marigolds and other popular autumn flowers. When starting johnny jump-up seeds indoors in late winter, barely cover the seeds with moist seed starting mix. Grow the seedlings under bright lights until they are large enough to transplant outdoors. Most gardeners save time by buying johnny jump-ups as bedding plants. 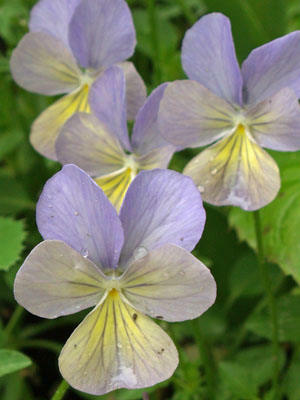 Johnny jump-ups come in an endless variety of color combinations, many of which have markings called "faces". johnny jump-ups are heavy bloomers that often reseed. Despite their small size, johnny jump-ups make nice blossoms to cluster together in a vase. Hot summer weather often leads to the demise of spring-planted johnny jump-ups.